On the recent update of October 12th 2014 you can find the review undersigned wrote for Anthropophobe’s debut album Le Royaume Des Morts. A short biography about this project, the guy behind it (who also runs Soleil Blanc Productions), and the project Pagan Assault (a review on their 2014-album Requiem For Illusions will be written and posted soon too; on 09/09/14 Concreteweb updated the review for the Pagan Assault-debut Révolte Contre La Destinée) are described in that review, so I will kindly refer to that chronicle in case you might care. This album is the third release on KFD’s Soleil Blanc-label, and combines two recordings that had not been officially released before. The compilation starts with the When Darkness Returns… album. KFD originally started writing on this material in 1999, and he recorded it in between 2007 and 2011 at his home studio. Then it took two years to mix the material, but the result is worth perseverance. 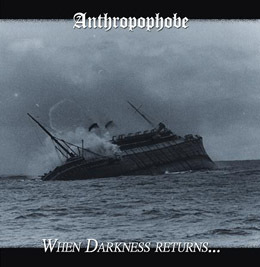 After a very short and untitled intro, Anthropophobe bring simplistic, minimal yet oh so misanthropic Black Metal in the vein of the glorious old days of Glory and Darkness. The melodic hymns are mainly fast, uncompromising, primal and morbid. But there is more, for this project includes slower passages to offer a nice contra-balance to the fierce aggression. Also the few keyboard additions (like in the darkthronish track Durch Den Dunklen Wald - ‘through the dark woods’) are great. On top of it comes the sound, based on a lo-fi production that truly suits these evil hymns. But it’s not just those elements alone that make When Darkness Returns… so fabulous. The songs in general are just great, with grandiose melodies interacting with blasting assaults, with rhythms and riffs focusing on the purest essence of the war-like tradition of Black Metal, with combining the filthiest basics of the Old School and mostly obscure principles from KFD’s own vision. And the (not that) fine-tuned execution of it witnesses of persuasion and conviction. Or in conclusion: truly a nice piece of primal Black Metal, and a must to be finally released officially!